This car sits high. The color is awesome. These HCS badges are brass and mounted with sheet metal screws! 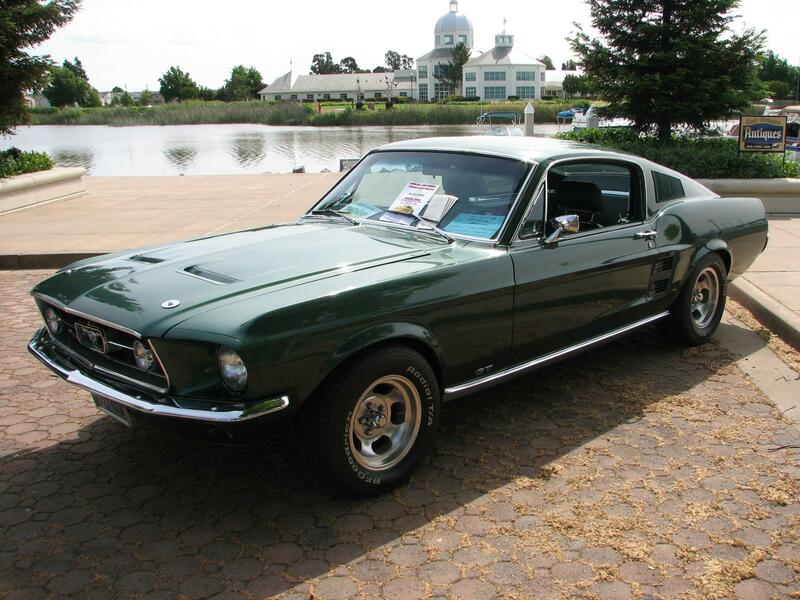 Randy sends us additional shots of his Aspen Gold 1967 Mustang High Country Special GT fastback. Aspen Gold 1967 Mustang HCS GT parked next to a field of gold flowers. Aspen Gold 1967 Mustang HCS GT fastback, left rear view. Lime Gold 1967 Mustang Sprint hardtop, front end view showing off the vented hood of the 1967 Sprint sports options package. Rear view of a Lime Gold 1967 Mustang Sprint hardtop. Interior view of a 1967 Mustang Sprint hardtop. The Sprint package came with a vinyl covered automatic shifter. Its hard to tell if this covering is still there. The steering wheel has been replaced. Another view of the 1967, Mustang, base, T-code, 120hp (at 4400rpm), 200 cubic inch, inline 6 cylinder engine with the Sprint optioned chrome air cleaner. Another shot of Bobby's 1967 Lone Star Limited Mustang. See the little Texas emblem on the front fender? It has a pony on top of the state of Texas - see this add. The chrome air cleaner on top of the 289ci engine is part of the Lone Star Limited package. It has a two tone interior. It has another Lone Star (Texas) emblem on the dash. Dusk Rose 1967 Mustang coupe that still wears it's original coat of paint! Dusk Rose was a special order paint. This one was ordered by Hensley-Anderson Ford in Bellflower, California. Dusk Rose 1967 Mustang coupe, right rear view. This car was purchased from the dealership in May of 1967. 1967 Ford Mustangs Thumbnail Collection. Page 16 of 39.